Ah it's been so long I had to read the destructions! Mr. Finnie! So lovely to see you again. My, yes, he is quite dreamy. Something about those eyes. He could definitely sell me some life insurance. 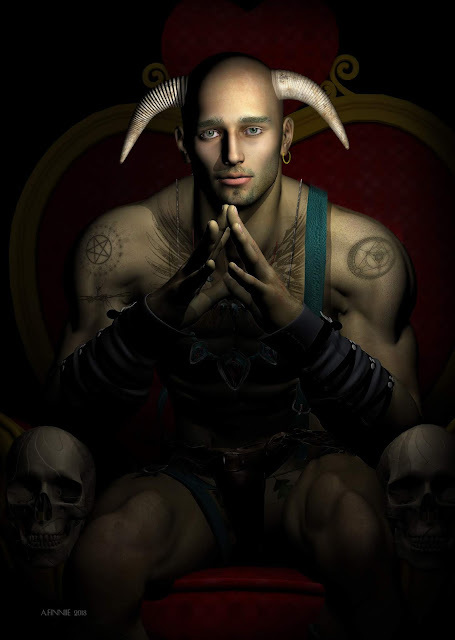 What is the point, I wonder -- no pun intended -- on downward-pointing horns. Personal shoulder massages? Oh ! Quel personnage ! Je pense que je pourrais aller dans les quartiers les plus sombres avec lui sans crainte !... sourire. Hya! Thank you so much for leaving a comment. I appreciate your time and thoughts. Hello! Thanks for coming by! Hola! Gracias por venir. Andrew Finnie is a traditional painter who, for the last several years, has specialised in digital media. Welcome to his illustration blog. Please look around. And don't forget to click for big. Your comments are gratefully received. Por favor, mire a su alrededor.Y no olvides hacer clic para grandes. Sus comentarios son muy bienvenidos. Danse Macabre; Geraldine in my Closet. Peace Dudes! A few Chrissie cards from down under. zen le marais d'orx ? Sarah Spina: Illustration deposit! Yeeeaaaahhh, shroight! Benjamin Lacombe - Oh dear this is amazing! andrew finnie waxfin@gmail.com. Powered by Blogger.